Numberblocks episodes A fantastically motivating way to teach the children about numbers. Now featuring numbers up to 20! CBeebies Chinese New Year Resources Excellent resources to bring extra focus to our learning about Chinese New Year. Welcome to Reception! We have two classes, Mrs Ventre’s class and Mr Ward’s class. Mrs Ventre is joined by Miss Spollin and Miss Rimmer. Mr Ward teaches alongside Mrs Quinn and Mrs Dougan. Just touch the star of your child’s class to access class specific posts such as photographs and video links. We work hard to provide your child with a great start to school life and we are extremely keen to develop great relationships with the families of the children in our classes. We are a friendly, knowledgeable group of people who love teaching in the early years, so please don’t be a stranger. Please check our page for regular posts about what we have been learning and to learn about how you can help at home. During this exciting first term in school, our main topic is ‘Ourselves’. This is a brilliant topic as it covers a plethora of activities across the seven areas of learning in the Early Years Development Matters framework and we will be learning lifelong skills such as, healthy diets, exercise, staying well through knowledge of essential self-care skills and how our bodies work and also learning the names of the many parts of our bodies (do you know what the patella is? ), that help us to breathe, move and grow! The programme on the BBC iPlayer, ‘Get Well Soon’ is a tremendous resource for teaching your child about staying happy and healthy. We will learn about the beauty of the changing seasons (I would recommend watching the BBC series Autumnwatch together, it is amazing and this year it is set in New England, USA!) and wonderful festivals such as Harvest, Diwali and of course, Christmas. We will also learn about Remembrance Day, Bonfire Night and Black History Month. We hope you will enjoy working together at home on your child’s home school reading books and their Rimrose Hope half termly challenge sheets. Rimrose Hope Christian values are decent, human values and shining a spotlight on these every half term will help your child grow as a person. Thanks for your support, let’s make this a brilliant year. I am sending out some resources to help with oral blending (pre-reading skills) and oral segmenting (pre writing/spelling skills). Rhyming and awareness of the initial sound in words is a really important skill. It helps the children understand that words are made up of sounds. This is a major step towards reading and writing words independently. We have been teaching the children how to be ‘tuned’ into language and letter sounds so that they will be thoroughly prepared to learn how to read and write independently through the use of phonics. To be able to read words, the children need to be able to recognise the letter (grapheme) in a word, say the sounds (phonemes) in that word and then ‘blend’ these sounds together to read the word independently, for example d-o-g and then say the word dog. To spell words independently, the children need to be able to ‘segment’ the sounds in words. For example, the word dog is made up of three letter sounds. The children need to be able to hear and isolate all of these sounds in order to spell the word. Generally speaking, segmenting is a more challenging skill to learn than blending. 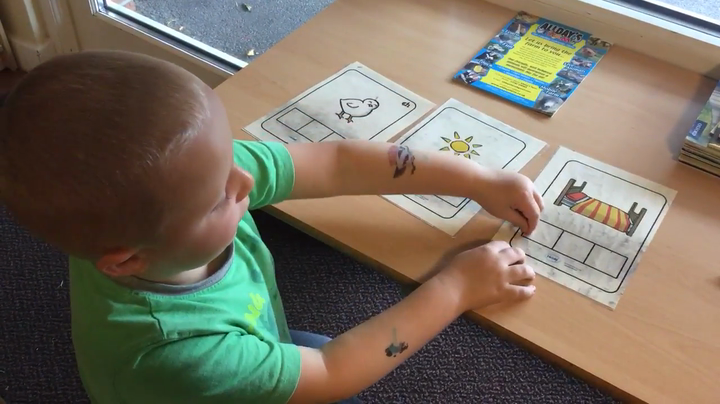 To help the children become strong and secure with these vital literacy skills, we use a range of resources and techniques. 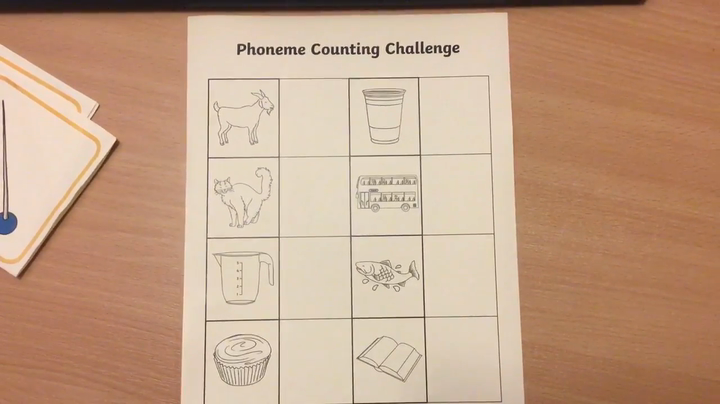 I have made a video with one of my pupils to demonstrate an effective use of a phoneme frame. To be able to isolate sounds in words, the children need to have a good awareness of rhyme and alliteration. We will supply some resources that you can use at home to help your child master these skills.